Posted on 04 Dec 2017 in Karen's words of wisdom! As a professional baker and cake decorator I am well versed in the art of designing cakes that make maximum impact, that can also be adapted to suit any occasion and this one is a prime example. Each tier can be used as a design in its own right, in any combination, any order, all the same style, even a different colour scheme. The skill set need to achieve each effect on each tier is relatively simple in cake decorating terms, so for the less experienced amongst you it’s a great one to get under your belt. Shall we get started? The bottom tier of my cake has that classic red Christmas colour inside by using Karen’s Cakes easy to make red velvet cake mix. Just add eggs, oil and water and bake as per the instructions on the packet. The advantage of this mix and the 3 other flavours we sell is the consistency achieved each time you bake, it has good cutting qualities and it keeps well, around 5 to 7 days, allowing you to get ahead, oh and it taste good! 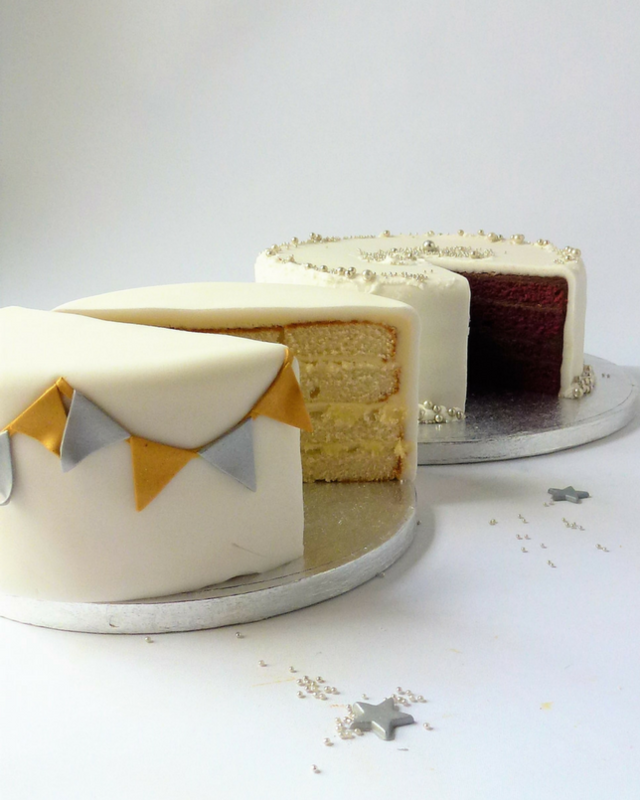 Similarly, the top 2 tiers are that firm favourite vanilla made with our premium vanilla Genoese mix. This is the best and probably the most adaptable of all our mixes, it has a soft crumb that has great cutting and carving qualities, keeps well for 10 days or more from baking and you can add your favourite flavours to the raw cake mixture with easy. I like to bake my cakes in 2 shallow tins and then once they are completely cool divide each layer in half using a sharp saw edged knife creating 4 layers of cake ready for filling. I havd pimped up the 2 different cake mixes by layering with buttercream made with our brand-new chocolate milk shake flavoured icing sugar for the red velvet cake and salted caramel for the vanilla Genoese. To make add butter and whip into a light fluffy buttercream, which takes a little time but it’s worth doing as it will be much easier to work with and nicer to eat. The pack advises adding some milk to soften but I prefer to add cooled boiled water instead or possibly for a more adult flavour your favourite tipple. Do not overfill the layers with buttercream as this will cause the cake to have ridges where the buttercream oozes out with the weight of the sugar paste icing, that is why I advise having 3 thinner layers of buttercream to sandwich the 4 layers of cakes together. Next place the cake on a cake board or some baking parchment so you can move the cake around as you coat it. Coat the top and sides with a generous layer of buttercream leaving a little for final coat, smooth the surface using a cake scraper if you have one. Now cover the top and sides of your buttercreamed cake with cling film releasing any air that is trapped and gently smooth the surface. This is the easiest way to achieve a smooth even coating of buttercream. Refrigerate for a minimum 30 mins. Once the cake is chilled carefully peel off the cling film, spread another thin layer of buttercream over the cake for the icing to stick to. On a clean work top lightly dusted with cornflour or icing sugar knead sugar paste until soft and malleable, this helps to prevent cracking in your finished coat. Using large rolling pin roll the sugar paste out into a circle large enough to cover the top and sides of your cake and around 4mm thick. 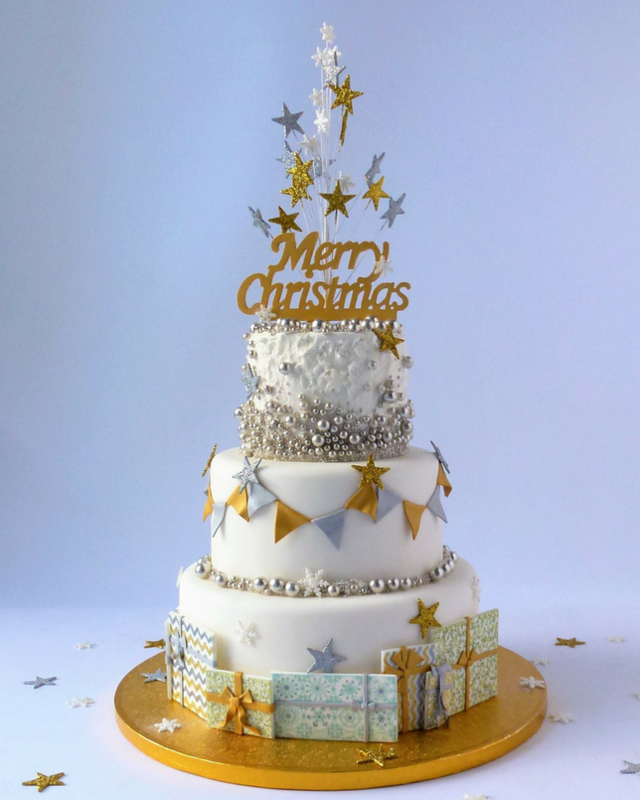 Make sure you keep turning the sugar paste and there is a good dusting of cornflour or icing sugar underneath at all times to prevent the icing from sticking. Now place the rolling pin onto the top and centre of the sugar paste and fold it over it towards you. Carefully lift using the rolling pin and place the bottom edge nearest the icing against the bottom of the cake. Drape the over the cake to cover it. Using the flat of one hand gently smooth over the top to secure the icing making sure there is no air trapped, if there is carefully push the bump towards the edge of the cake to release. Then work down the sides, starting with the top edge and working around and down, turning the cake as you go. Open the pleats of icing out and ease back in to smooth them out making sure the icing is stuck to the buttercream underneath. Carefully trim the excess icing off from the base of the cake using the paring knife, leaving 5mm surplus of icing around the base of the cake. Use a smoother and a gentle ironing action, smooth over the whole cake making sure the sides are straight and the top flat. Trim the remaining excess icing from around the base to create a neat finish at the base of the cake. Use a scriber tool or large pin to make a tiny hole and releases any air that is trapped. 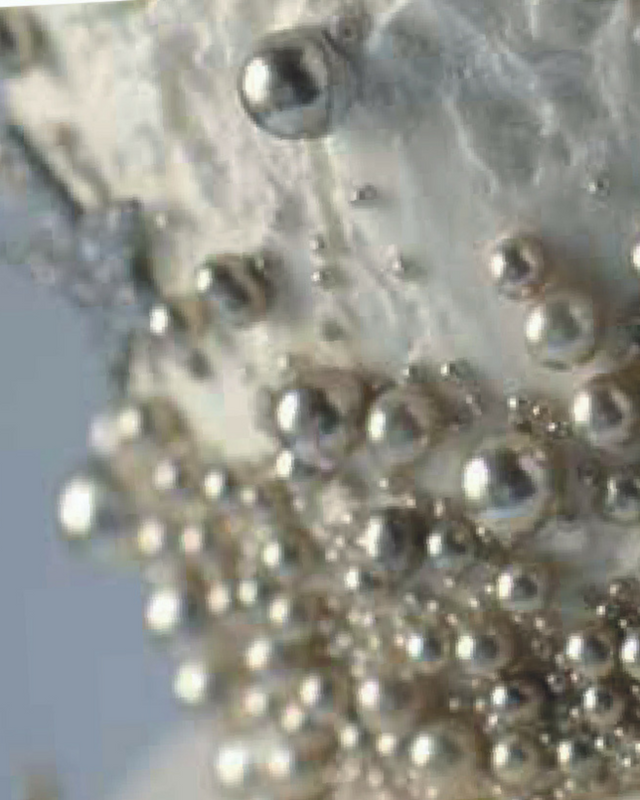 (Trapped air is seen as bumps on the icing). Inspect the excess icing for buttercream and cake crumbs and cut these out. This icing can be reused on the other tiers. 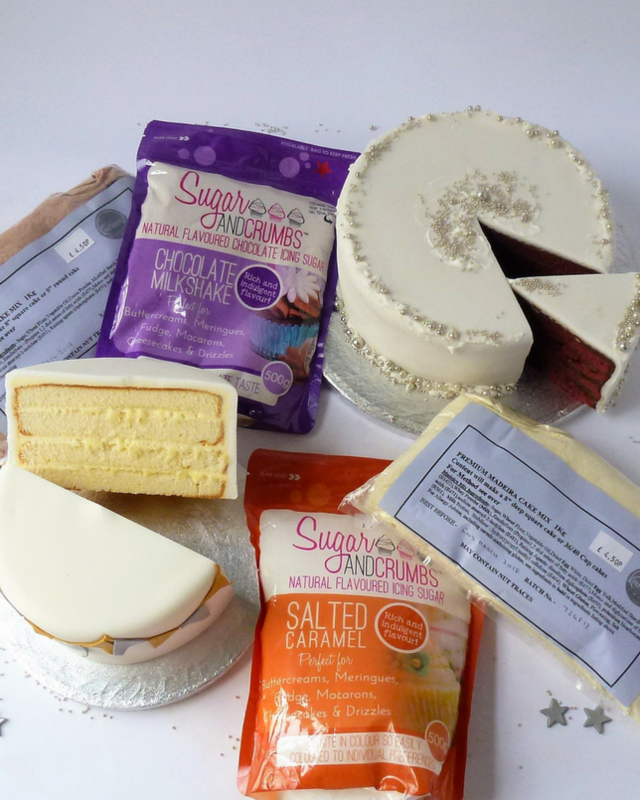 If you want to get ahead the cakes can be frozen at any of these 3 stages, baked, filled and coated with buttercream or coated with icing but make sure they are fully defrosted before you start the next stage. We can give you advise on how to this in-store. These are made from Karen’s Cakes pre-printed edible icing sheets. I’ve used the silver and gold designs, but we also have these in lots of different colour combinations, just ask in-store. I have cut each gift out using scissors and keeping the backing sheet on. Knead some white modelling paste until soft and malleable. Roll out using a rolling pin to 1mm thick on a work top lightly dusted with a little cornflour or icing sugar. Once the parcels are all done and are dry, you can enhance the patterns by using the gold and silver pens or paint if you wish. I’ve added ribbons and bows gold and silver modelling paste and attached them using edible glue. The finished gifts can be made in advance and stored in a non-airtight box. 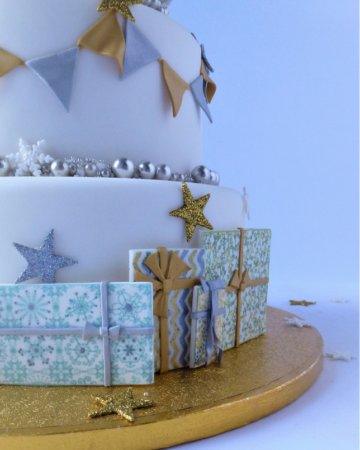 Arrange the gift decorations around the bottom tier using royal icing in a piping bag. The bunting is made from gold and silver modelling paste. Make 6 evenly spaced marks around the top edge of the cake and lightly score a curved line between each mark. Roll out each modelling paste colour as thinly as possible, cut 6 x 2mm wide strips to fit on the curves from one of the colours and stick on using a small paint brush and edible glue. Cut-out the bunting using a card template or cutter and stick 2 of each colour to each section. Cover the join with a star attached with royal icing. Although this looks like it would be hard to do it is probably the easiest part of this design! 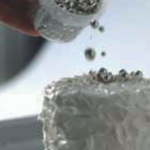 I’ve used a pot of mixed sized silver balls, but these come in all different colour combinations to suit any occasion. Place the cake onto an upturned plate, cover with a generous layer of royal icing roughed up using a palette knife, then place in a shallow tray. 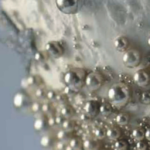 Tip a pot of mixed-sized silver balls over and use a soft brush to evenly distribute them over the top of the cake and up the sides by brushing the fallen balls back up and on to the soft icing . 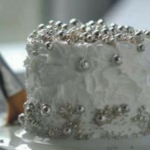 The remaining balls that don’t stick can be used to decorate around the base of the 2nd tier once you have stacked the cake together, pipe a thick line of royal icing to stick the balls to. The cakes can be made as individual designs or stacked together. Easy cut plastic dowels couldn’t be simpler to use to support your tiered cake. Place each cake on a slightly smaller thin board and for both the bottom and middle tiers, push 4 dowel rods into those tiers, evenly spaced. Make a mark on each dowel with a pen or pencil where the top of the cake comes to. Take each dowel out and cut with scissors just above the mark, then push back into the cake. 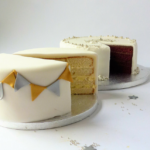 Add a blob of royal icing to the centre of the bottom cake, using a plate knife to lift the second cake with the thin cake board still in place underneath onto the bottom tier, push down gently to secure and being careful not to damage the bunting. Repeat this process with the top tier cake. 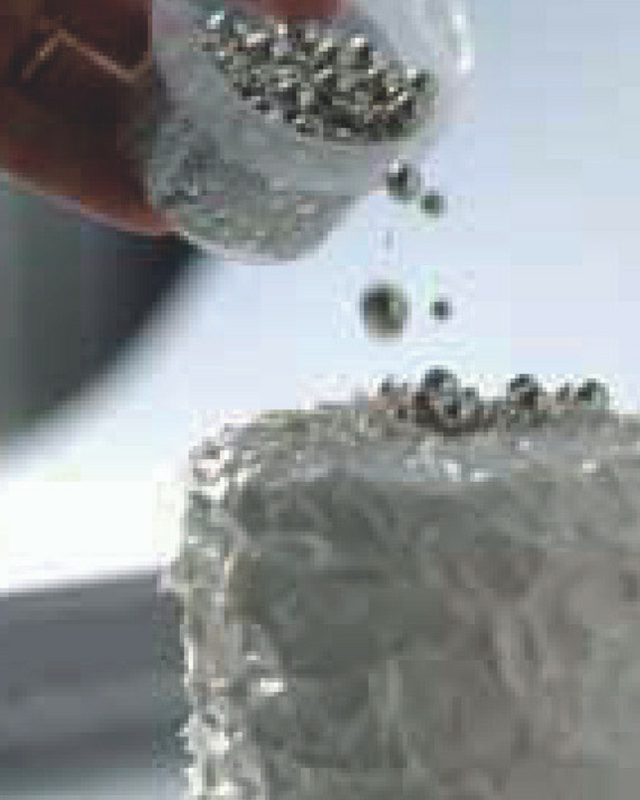 You may find some of the silver balls fall off at this stage, these can be stuck back on using a little royal icing. 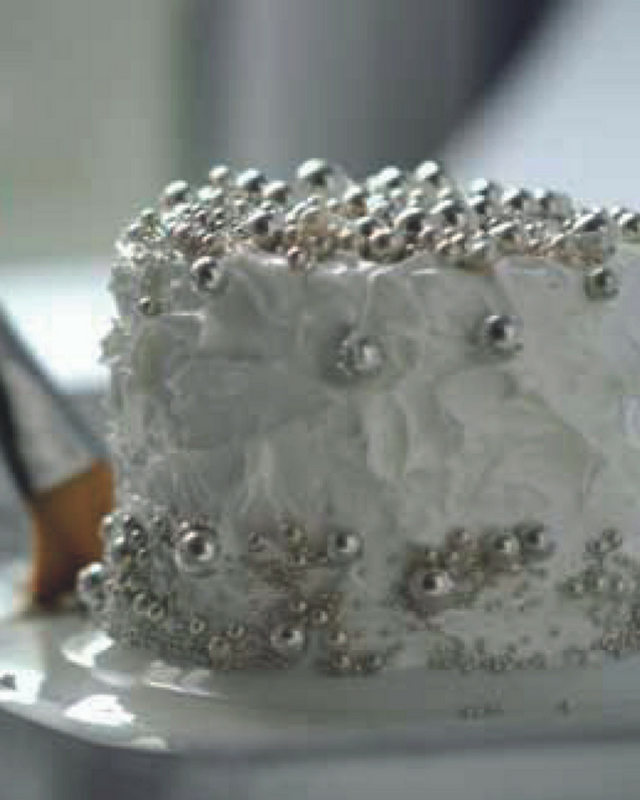 Stick the pre-prepared gift decorations using royal icing in a piping bag. Push the Merry Christmas topper into the centre of the top tier and the star spray topper behind it. Add confetti stars and snowflakes anywhere you wish using royal icing in a piping bag. Use any remaining balls around the toppers. At Karen’s Cakes we stock everything you need to make this cake, from top to bottom. We are happy to advise you on the amounts of cake-mix, baking times, buttercream and all the various other icings etc. you require to make and decorate this show stopping cake when in store. We also have lots of free leaflets to help you make all sorts of other cake decorating projects and helpful, knowledgeable staff to guide you through your purchases.